'Left'to'right: Carol Fierke, John Lowe, David Ginsburg, Alan Saltiel, Gary Glick, Dan Klionsky (Not pictured, Rowena Matthews). Photo by Gregory Fox, Courtesy of U-M.
*Click on photos for high resolution images. Carol A. Fierke Ph.D., Professor of Chemistry and Biological Chemistry. A chemist who has spent her career working at the interface with biology, Fierke studies enzymes, the chemical catalysts of living systems. One focus of her current work is the ubiquitous metal zinc and the role it plays in chemical catalysis and regulation. She wants to understand how zinc levels are regulated and what functions the metal plays in mammalian cells. New treatments to regulate zinc concentrations may decrease neuron injury that occurs after stroke, hemorrhage, seizures or brain trauma. Her lab is also investigating an enzyme that puts fat-based "tags," much like mailing labels, onto proteins to direct them from the cell’s interior to its outer membrane. And she’s looking at enzymes that catalyze key metabolic reactions in bacteria. Research in these areas may point to new methods for interrupting the operation of cancer cells and for developing new antibiotics. David Ginsburg, M.D., Warner-Lambert/Parke-Davis Professor of Medicine, Professor of Genetics and Internal Medicine, Howard Hughes Investigator. As a physician specializing in blood disorders and genetics, Ginsburg studies the genetics and molecular biology of blood clotting. There is a complex cascade of chemical signals that forms a clot quickly to staunch bleeding from a wound, but these signals are also controlled well enough that they don’t normally careen out of control and create clots where they’d be damaging. "It’s got to be just right," Ginsburg says. He is studying human families with bleeding disorders like hemophilia and mice with genetic "knockouts" to tease apart the complex interactions of biomolecules that control the clotting response. 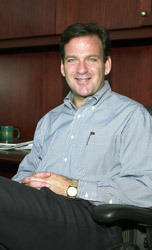 Gary D. Glick, Ph.D., Werner E. Bachmann Collegiate Professor of Chemistry, Professor of Biological Chemistry. Glick is using the tools of synthetic chemistry to develop a deeper understanding of cellular biology. One portion of his research is looking at the structure, folding and dynamics of DNA and its messenger, RNA. Related to this work is a project to explore immune system proteins that bind to DNA in inflammatory diseases like systemic lupus erythematosus and rheumatoid arthritis. This research has led to the discovery of a new family of molecules with the promise of being better treatments for lupus and related disorders. His closest collaborations are with medical school faculty rather than fellow chemists, and many of his graduate students are in a combined MD/PhD program. Alan Saltiel calls him "a biologist’s chemist." Daniel J. Klionsky, Ph.D., Professor of Molecular, Cellular and Developmental Biology and Biological Chemistry. Klionsky uses baker’s yeast as a model organism to study how proteins are moved around the cell with great specificity, and how the organelles, machines within the cell, develop and do their work. Sorting the proteins out so that they go to the proper organelle and do the right job is essential to the proper functioning of the cell, but little is understood about it. Klionsky’s work also explores "autophagy," the main protein disassembly and recycling system inside the cell, and how it responds to starvation conditions by cannibalizing parts of the cell. This work offers intriguing clues into a variety of human diseases, including cancer, cardiomyopathy (weakening and enlargement of the heart) and neurodegenerative diseases like Alzheimer’s and Parkinson’s. John B. Lowe, M.D., Warner-Lambert/Parke-Davis Professor of Medicine, Professor of Pathology and Howard Hughes Investigator. As a post-doctoral fellow in pathology, Lowe became intrigued by the complex carbohydrates that coat the outside of animal cells. Although these sugar molecules are the cell's first line of interaction with its environment, almost nothing was known at the time about their functions. In two decades of subsequent work, Lowe and his colleagues have isolated genes that control the assembly of complex carbohydrates, and used these genes to uncover functions for these molecules in the immune system. Working at the intersection of immunology and carbohydrate biology, Lowe continues to explore complex carbohydrate assembly and function using genetically altered mice, and cells grown in the laboratory. His research is shedding light on cellular signaling processes, and on inflammatory diseases like arthritis, psoriasis and hardening of the arteries. 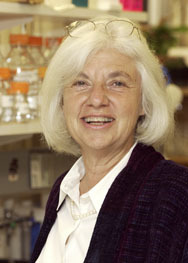 Rowena G. Matthews, Ph.D., G. Robert Greenberg Professor of Biological Chemistry and Senior Research Scientist in the Biophysics Research Division, Member of the National Academy of Sciences. Ever since she was a Radcliffe undergrad working in the lab of a future Nobel prizewinner, Matthews has studied the biochemicals we call vitamins and their role in the chemical reactions of the cell. A decade ago, her work crossed paths with findings from clinical medicine that heart disease was linked to elevated blood levels of an amino acid called homocysteine. Matthews’ work on riboflavin and folic acid has helped determine how homocysteine levels can be controlled, even in patients who have a genetic mutation that could lead to harmful levels of the amino acid. Neural tube birth defects are also linked to the function of folic acid. Matthew’s work has contributed to the recommendation that all people  especially pregnant women  should consume more folic acid. Since folic acid supplements were recommended, blood levels of homocysteine in Americans have fallen by an average of 20 percent, which may lower the risk of heart disease. Alan R. Saltiel, Ph.D. , Director, Life Sciences Institute, John Jacob Abel Collegiate Professor in the Life Sciences, and Professor of Internal Medicine and Physiology. Saltiel’s trailblazing work on the hormone Insulin and its role in regulating cellular sugar levels has expanded into an investigation of how cells send and receive signals. "Cell signaling encompasses everything from the cell surface to the nucleus and everything in between," Saltiel says. "It’s not new  it’s been hot for a long time  but there’s so much to learn." Saltiel’s laboratory has pioneered the concept that cell signaling is confined to defined pathways within the cell, adding another level of complexity to our understanding of cellular regulation. A 1995 paper he co-authored on cellular signaling remains the most cited paper from the Proceedings of the National Academy of Sciences. (Citation rates are an indicator of a paper’s significance.) Much of his career has been spent in private-sector pharmaceutical work, most recently with Warner Lambert/Parke-Davis in Ann Arbor. Saltiel joined the Institute in March 2001 as its first faculty member.